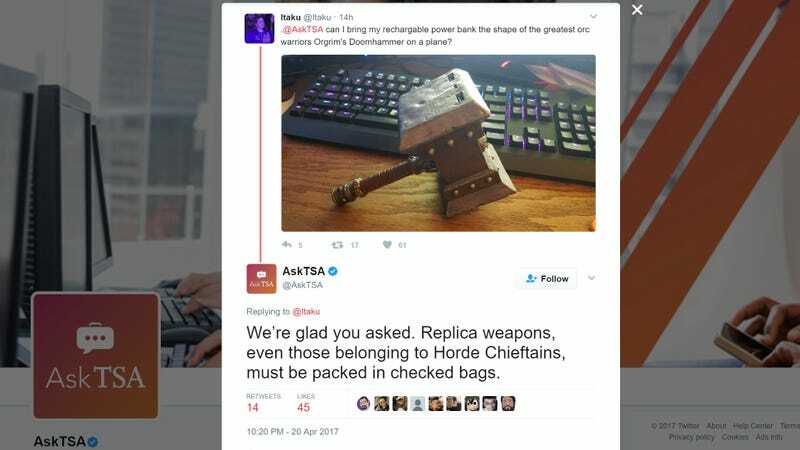 According to an exchange with the TSA’s official Q&A Twitter account (via /r/wow), even World of Warcraft Horde Chieftans have to check their weapons on flights. But should that weapon also be a lithium ion power bank, then Azeroth is truly doomed. In the proper hands, Orgrim’s Doomhammer could by one of the keys to Azeroth’s salvation, but replica weapons must be placed in checked bags in order to travel through the sky alongside legendary heroes. But another TSA rule stipulates that lithium ion power banks must be wielded in carry-on luggage only. But wait . . . there may still be hope. How much is next-day air to the Broken Isles?